I have a nice 2 pound pork loin and I have some lima agria, so I thought I would try to make the Mexican pasta de achiotte. I juiced the limes, about 6 or 8. I thought I had a lot more juice than I needed, but that proved to not be true. I did heat the limes in the microwave for 22 seconds, to extract as much juice as possible. I had purchased some powdered Annatto at the market. It was a good red color and I'm hoping it's fresh. The paste I used to see at the Salvadorian market in plastic bags was almost a bright brick red. I think the Los Angeles County Health Department made them quit selling it as it had no "label". To about 1 fluid ozs. of lime juice, I added 1 tbs. 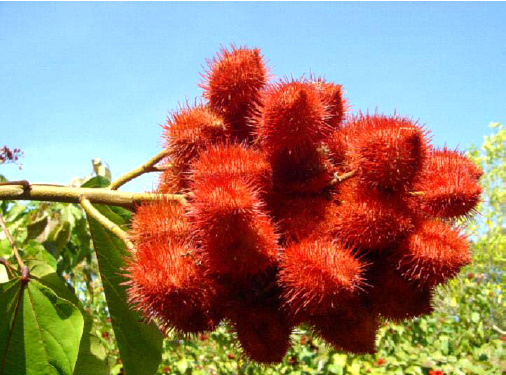 of annatto. Then I added crushed garlic, about 1 tbs. Next I added 2 tsp. of cumin, a dash of Bijol, 1/2 tsp. of bay leaf, 3/4 tsp. of pepper and 2 tsp. of Knorr Swiss chicken boullion powder (mostly for the salt). Madly mixing, I got a nice color. Then I added about 2 tsp. or oregano, a heaping 1/4 tsp. of chile de Arbol, 1 tsp. of onion powder. I mixed some more. Then I thought the quantity of paste insufficient for 2 pounds of pork loin, so I added another tablespoon of Annatto powder and another tablespoon of lime juice. That gave the right thickness and a about 3 tbs. of pasta. Note that I have not used vinegar, which is classic in making this sauce. Also, I've never seen salt in a recipe and I think that a big mistake. 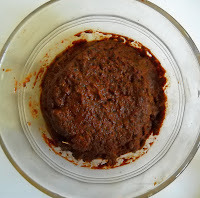 This is the classic rub or marinade (it's to dry to call a marinade, but it isn't dry like a rub, either) for Cochinita Pibil.